THE CHICKEN THAT PLAYS THE PIANO IS HERE ! ! ! If I told you that I had seen a chicken play a piano, you would not believe me. So, here’s a video for you to enjoy and to prove that I would never lie to you. Hope you enjoyed the goodies for today ! ! ! I first met Mrs. Estela Zamora Kramer when I started my teaching career at age 19 as an English/journalism teacher at Christen Jr. High School in Laredo, Texas. Mrs. Kramer was head of the school’s Physical Education Dept., and she made arrangements for me to teach a modern jazz dance class at Christen during my conference period. Because of that assignment, I became the first local male dance teacher in Laredo history. I also taught dance at the Galo Dance Studio in Laredo. And I can never forget that Julia Vera, a 9th grader at Christen, was one of my dance students. She, of course, went on to make show business history with her acting career in Hollywood, where she still works now. As we honor the memory of dear friend Mrs. Estela Zamora Kramer today, I have to explain to you what I feel. I really believe she is in heaven, and from there, she is still watching over all of us, and our well-being. We will continue now with a tribute by Mrs. Cynthia Haynes Ramirez, then we’ll glance at the article in the ever wonderful Laredo Morning Times. At the very end of this entire message, be sure and click and watch the video of The Golden Spurs performance at Laredo’s Shirley Field in November 2016. In 1963, then LISD Superintendent J.W. Nixon, Christen Jr. High Principal, Vidal M. Trevino, Lamar Jr. High Principal, W. E. Lockey who would become the first principal at the new high school met with Mrs.Estela Zamora Kramer to request her help in being a part of establishing the new school being built at 2000 Plum St.
Because of her knowledge in dance, swim and physical education she would be needed to head and develop the physical education department at J.W. Nixon High. Mrs. Kramer credits God for the vision to embark on this new project, her dance professor at TWU – Jeanette Slothman, and SMU Band Director Irvin Drybrough and all her dance training that helped her to establish a new concept – dance team. Up until then, most high schools had a pep squad. This would be different. Mrs. Kramer accepted the commission and the rest is history but let’s take that journey that began in 1964. Many people helped to create what this new dance team would wear – Neo Gutierrez, Connie Kazen, Sam Zamora, and Martin Barrera are a few who made recommendations and shared their ideas which would become the Golden Spurs. The Mustang cheerleaders would wear the green and gold school colors but the Spurs would wear white – for its elegance and the gold sequence for the sparkle. The hat would go along with the western theme of the Mustang mascot and the boots would have the spurs to make that very identifiable sound as they hit the pavement. The name came from the spurs on the boots which was suggested by Mrs. Kramer’s brother Zam Zamora who as a student at Texas A&M University had seen the Aggie Corps and cadets wear spurs on their boots. So began the J.W. Nixon High School Golden Spurs who would become locally, nationally and internationally known. They became the Ambassadors of Goodwill for Nixon High School and their community setting a precedent for the local and surrounding area high schools. Another task Mrs. Kramer was commissioned for was to develop the physical education program at Nixon High She had a vision for this and so began a life time sports program which included tennis, archery, swimming, bowling, folk dancing and of course the required physical skills as part of the PE Curriculum. She, along with the Women’s City Club members like Barbara Kazen and Frances Villarreal organized the first female track meet in Laredo held at Shirley Stadium in 1965. All this, years before Title IX which gave females the same athletic opportunities as males. As a young girl of 16 Mrs. Kramer was the first female to teach swimming at the Laredo Boys Club under the direction of Fernando Pena and it was then that she began to put on water pageants with her students. This program continued with the opening of the Webb County Swimming Pool with the help of then Webb County Judge Roberto Benavides. The community looked forward to these shows as it was something different and new in Laredo. The Golden Spurs became locally known by performing community service all around the city – WBCA Dance Festival, Parades, Mr. South Texas Luncheons, ribbon cuttings and of course attending and performing at every Nixon football and basketball game. They performed their exciting high kick routines live on KGNS during the WBCA pre-parade program captivating the audience from the US and Mexico. Mrs. Kramer also started the first Youth Dance Festival in 1965 in conjunction with WBCA. These festivals filled Shirley Stadium with hundreds of dancers as it included all elementary, junior high and high school physical education students. The Spurs began their national travel schedule when Richard Nixon, running for President in 1972 came to campaign in Laredo and was so impressed with the Golden Spurs , that he personally invited then Golden Spurs Marshal Pam Rodriguez Juarez and the Golden Spurs to come to his inaugural parade. Well he was elected and off to Washington D.C. for the Spurs with the help of Billy Hall and then US Representative Chick Kazen. Hollywood here they come! The Golden Spurs became stars as they participated in a Cultural Exchange with the students at Beverly Hills High School thanks toDr. Neo Gutierrez,former Laredoan who taught at Beverly Hills High School for 32 years.They also performed at Disneyland’s 25th anniversary and at the famous LA Dodger Stadium. The Golden Spurs then continued their travels all over Mexico performing in Mexico City, Monterrey, Vera Cruz, Guanajuato, Tampico. They especially enjoyed being invited by Raul Velasco to perform on Siempre en Domingo the most popular Variety Show in Mexico at the time. Eva Garza, Luz Martinez, Pitin Guajardo, Bill Haynes, and Adrian Martinez were among those representing Laredo along with the Spurs. A memorable event was the Spurs performance at the Juegos Classicos in Mexico City where the venue held 110 thousand spectators. Jerry Jones, owner of the Dallas Cowboys made reference to that event by saying it was the only venue to hold so many people other than his new football stadium. Spurs go north to Canada where they performed at the World Soccer Championship between Canada and Italy. No other dance team in Laredo or the surrounding area can match or exceed this fabulous journey that 2,500 Golden Spurs have travelled since the beginning in 1964. Laredo ISD would open a new high school in 1983 and Mrs. Kramer would once again be commissioned to create a new dance team. So off to Cigarroa High School she would go to develop the Silver Roses dance team. A team that would bring great pride to the new school in south Laredo. To Mrs. Kramer and the many people who supported and had a part on this journey, THANK YOU!!! Mrs. Kramer you indeed touched many lives and you see the fruits of your labor everyday as former Golden Spurs and Silver Roses who are successful in many areas continue to be in your life. One word is not enough to describe you. Visionary because you were always a step ahead and original so your list of firsts is long and amazing. Pride – you instilled in your Spurs to be proud of who they are and pride in their school and community. Dedication – Your enthusiasm and commitment to Spurs and the community was the example that you gave many. Courage – strength you instilled in all to take the challenge to do the things you want to do and go out in your community to give back. 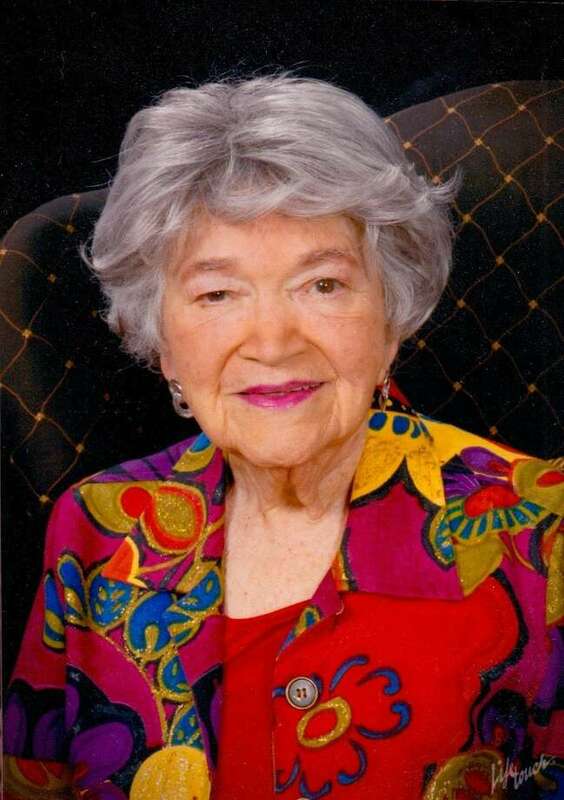 Estela Zamora Kramer, 89, was called by the Lord to her resting place in Heaven on Monday, December 31, 2018. Mrs. Kramer is preceded in death by her husband, Walter Harry Kramer, Jr.; son, John David Kramer; brother, Arnulfo Zamora, Jr., Delia D. Zamora and grandnephew, Alejandro Salinas. Left to cherish her memory are her children, Betty (Fred Gerhart) Kramer and Walter (Angie) Kramer, III; sister, Rose Ann Salinas; nieces and nephews, Delia Z. Salinas, Mina Rudd, Michael Rudd, Silvia Salinas, Miguel Salinas, and Gil Garcia; grandnephew, Carlos A. Salinas, special friends, Dr. Cecilia M. “May” Moreno, Mary Elva Cruz, Cindy Rodriguez, Cynthia Haynes Ramirez, and Maggie Bonugli, other family members, and friends. The family will receive guests on Sunday, January 6, 2019, from 5:00 pm to 9:00 pm at Fred Dickey Funeral & Cremation Services. A holy rosary will be recited at 7:00 pm. Funeral services will be held on Monday, January 7, 2019, at Blessed Sacrament Catholic Church. The funeral mass will be celebrated 9:00 am. The family encourages to meet at the church. In lieu of flowers please make contributions to the Estela Zamora Kramer Memorial Scholarship Fund, Texas A& M University, 5201 University Blvd, Laredo, Texas. This YouTube video shows the costumed Nixon High School Golden Spurs in performance at Shirley Field in Nov. 2016. AND IT’S TIME FOR … A MAJOR ART LESSON ! In an art career that lasted less than 20 years altogether, French artist Henri de Toulouse-Lautrec created incredible paintings, watercolors, posters, drawings, ceramic and stained-glass art, and an unknown number of lost art works. For a great view of his art work go to the art site listed at the very end of this entire message ! Henri Marie Raymond de Toulouse-Lautrec-Monfa (24 November 1864 – 9 September 1901), also known as Henri de Toulouse-Lautrec (French: [ɑ̃ʁi də tuluz lotʁɛk]), was a French painter, printmaker, draughtsman, caricaturist, and illustratorwhose immersion in the colourful and theatrical life of Paris in the late 19th century allowed him to produce a collection of enticing, elegant, and provocative images of the modern, sometimes decadent, affairs of those times. After the death of his brother, Toulouse-Lautrec’s parents separated and a nanny eventually took care of him. Toulouse-Lautrec’s parents, the Comte and Comtesse, were first cousins (his grandmothers were sisters), and he suffered from congenital health conditions sometimes attributed to a family history of inbreeding. At the age of 13, Toulouse-Lautrec fractured his right femur. At 14, he fractured his left. The breaks did not heal properly. Modern physicians attribute this to an unknown genetic disorder . Physically unable to participate in many activities enjoyed by males his age, Toulouse-Lautrec immersed himself in art. He became an important Post-Impressionist painter, art nouveau illustrator, and lithographer, and, through his works, recorded many details of the late-19th-century bohemianlifestyle in Paris. Toulouse-Lautrec contributed a number of illustrations to the magazine Le Rire during the mid-1890s. By February 1899, Toulouse-Lautrec’s alcoholism began to take its toll and he collapsed from exhaustion and the effects of alcoholism. His family had him committed to Folie Saint-James, a sanatorium in Neuilly-sur-Seine for three months. While he was committed, he drew 39 circus portraits. After his release, he returned to the Paris studio for a time and then traveled throughout France. His physical and mental health began to decline rapidly owing to alcoholism and syphilis, which he reportedly contracted from Rosa La Rouge, a prostitute who was the subject of several of his paintings. On 9 September 1901, at the age of 36, he died from complications due to alcoholism and syphilis at his mother‘s estate, Château Malromé in Saint-André-du-Bois. He is buried in Cimetière de Verdelais, Gironde, a few kilometres from the estate. He excelled at depicting people in their working environments, with the colour and movement of the gaudy nightlife present but the glamour stripped away. He was a master at painting crowd scenes where each figure was highly individualized. At the time they were painted, the individual figures in his larger paintings could be identified by silhouette alone, and the names of many of these characters have been recorded. His treatment of his subject matter, whether as portraits, in scenes of Parisian nightlife, or as intimate studies, has been described as alternately “sympathetic” and “dispassionate”. Toulouse-Lautrec’s skilled depiction of people relied on his painterly style, which is highly linear and emphasizes contour. He often applied paint in long, thin brushstrokes which would leave much of the board underneath showing through. Many of his works may be best described as “drawings in coloured paint”. LET’S GO TO THE WORLD’S LARGEST HALLOWEEN PARTY ! In the Los Angeles metropolitan area, West Hollywood is located between Beverly Hills and Hollywood. Every October 31, West Hollywood celebrates the world’s largest Halloween party with a huge street celebration and parade at 6 pm. The celebration goes on till 6 o’clock the next morning. And I live 10 blocks away from where it all happens ! Thousands of revelers jammed the streets of West Hollywood for the city’s annual Halloween Carnaval on Wednesday night. The free festivities, which spanned a one-mile stretch of Santa Monica Boulevard between Doheny Drive and La Cienega Boulevard, included live music and DJs as well as parties at bars and hotels along the route. Among the costumes spotted were a Queen of England, a panda, a herd of pigs and, of course, a Donald Trump or two. The partying proceeded peacefully, with Los Angeles County sheriff’s deputies making no arrests. “It’s been a great night from a public safety standpoint,” said Capt. Sergio Aloma of West Hollywood station. The total attendance throughout the evening was between 150,000 to 200,000 people, according to estimates from sheriff’s deputies in helicopters and on the ground, Aloma said. If you love dance like I do, your tv will be on ABC-TV every Monday and Tuesday night from 8 to 10 p.m. That’s when DANCING WITH THE STARS is on the air. By the way, the show happens in a tv studio located 8 blocks from where i live in West Hollywood ! For the current season, see Dancing with the Stars (U.S. season 27). Dancing with the Stars is an American dance competition television series that premiered on June 1, 2005, on ABC. It is the US version of the UK series Strictly Come Dancing. The show is hosted by Tom Bergeron, alongside Erin Andrews, who became co-host in season eighteen. Lisa Canning was co-host in the first season, Samantha Harris co-hosted seasons two through nine and Brooke Burke-Charvet in seasons ten through seventeen. The twenty-seventh season premiered on September 24, 2018, and its spinoff Dancing with the Stars: Juniors will premiere on October 7, 2018. Tom Bergeron has been the host since the program’s premiere in 2005. In season 1, his co-host was Lisa Canning. She was replaced by Samantha Harris for seasons 2 through 9 (2006–09), who was then replaced by Brooke Burke-Charvet from seasons 10 through 17 (2010–13). Erin Andrews took over as co-host starting in season 18 (2014). Drew Lachey served as a temporary replacement for Harris during season 5 (2007) during her absence for 3 weeks due to maternity leave. Leah Remini filled in for Andrews in week 6 of season 19, due to commitments with the 2014 World Series and filled in for her again in weeks 6 and 7 of season 21 for the 2015 World Series. Season 19 champion Alfonso Ribeiro filled in for Bergeron on week 4 of season 21, due to Bergeron’s ailing father. The scoring begins with the judges’ marks. Each judge gives a numeric score from 1 to 10, for a total score of 3 to 30. The scoring was altered for the “all-star” season 15, during which judges could give scores at 1/2-point intervals from 0.5 to 10, for a total score of 1.5 to 30. When multiple performances are scored, only the cumulative total counts. The contestants’ judges’ shares are calculated as the percentage of the total number of points awarded to all contestants that evening. (For example, if a team earned 20 pts on a night when the judges awarded 200 pts, their judges’ share would be 20/200 = 10%.) This percentage is then added to the percentage of North American votes received by each contestant. The lowest-scoring two couples are identified at the end of the show, and the couple with the lowest combined total gets eliminated. Season 8 added an occasional ‘dance-off’, in which contestants could re-perform one of their dances, in an effort to improve their judges’ score. This was later discontinued. Public voting is conducted via a toll-free number, the ABC website, and, most recently, text messages and Facebook; contestants can vote during and immediately after each performance show. The maximum number of votes per voter per medium is equal to the number of couples performing that night, or five votes, whichever is larger. In April 2010, it was revealed that former contestant Kate Gosselin had e-mailed friends and family asking them to vote as many as 10 times each. In November 2010, The Washington Post reported that online voting appeared not to require a valid email address, and accordingly that numerous votes apparently could be cast by one person. Seasons 1 and 3 featured only two couples in the final week instead of three. Starting with season 16, four couples made it into the final week, although the top three finalists proceeded to dance one more time for the judges after the fourth place couple was announced. In season 20, there were three couples in the final week, but in seasons 21, 23 and 25, there were four. In seasons 22, 24 and 26, there were only three couples in the final week. On the April 18, 2006, episode of the Howard Stern Radio Show, Stern’s wife Beth said that she was guaranteed to earn $125,000 for just appearing on DWTS (in season 3) and could earn up to more than double the original sum, depending on how long she lasted on the program. In season 21, Bindi Irwin had her payments withheld by a Los Angeles County Superior Court judge because she was a minor, which therefore required her parents to sign-off on the contract. But although her mother signed, the contract lacked her father’s signature, so the judge refused to validate the contract, despite Irwin’s father being the world-famous naturalist Steve Irwin, whose death in 2006 had been widely covered in the news/media. The judge later validated the contract once Steve Irwin’s death certificate was presented to the court, resulting in Bindi receiving a $350,000 paycheck from the show. In seasons 9 and 10, three tribute performances were done to honor the memory of artists and others. The first was a tribute to recently deceased actor Patrick Swayze, on Sep 23, 2009. “She’s Like the Wind” from the Dirty Dancing soundtrack (originally written by Swayze for Dirty Dancing), “Unchained Melody” from his film Ghost, and “(I’ve Had) The Time of my Life” from Dirty Dancing were performed by select professional dancers of the show. PATRICK SWAYZE, btw, was from Houston, Texas, where he studied dance at his mom’s dance school. On Oct 20, 2009, a tribute was done for singer and dancer, Michael Jackson. “I Want You Back”, “Man in the Mirror”, and “Thriller” were performed—the first two songs by select professional dancers of the show, with all coming together for “Thriller”. In season 10, professional Haitian dancers performed as a tribute to victims of the 2010 Haiti earthquake on March 30, 2010. One of the male dancers, Emmanuel Pierre-Antoine, had lost his son in the rubble. They were dancing to “Dance Like This” by Wyclef Jean. An unofficial live tour show called Dancing Pros: Live! toured with several Dancing pros since 2010. A Dancing with the Stars: Live! official tour was announced on November 3, 2014, for the 2014-2015 season starting on December 27, 2014, in Niagara Falls, New York and ending February 15, 2015, hitting 33 cities. A second tour, “Dancing with the Stars Live! : Dance All Night” was announced. A third tour, Dancing with the Stars: Live! – We Came to Dance, was announced on October 3, 2016, for 43 cities from December 16, 2016, to February 14, 2017. A fourth tour, Dancing with the Stars: Light Up the Night, was announced in October 2017 and began on December 30, 2017, in Charlotte, North Carolina, performing 71 shows and ending in Los Angeles. Around 1962 in Laredo, Texas, Eduardo Cansino, father of dancing movie star Rita Hayworth, arrived to live and teach in Laredo, at the Galo Studio, where I also taught. He lived in Laredo around 3 years, in arrangements by Mrs. Genevieve Richter, a leading patron of the arts in Laredo. Previously, Mr. Cansino had his dance studio business in Hollywood. First off, please place the name of Eduardo Cansino, Sr., in your computer search box. When you find the Wikipedia write-up, go there for a concise look at his biography. One of his three children was Margarita Cansino, who took the name Rita Hayworth, in her work as a dancing Hollywood movie star. The name Rita came from Margarita, and Hayworth was Rita’s mother’s maiden name. By the way, my photo below was taken around that time, when I directed and produced the Feb. 22 Noche Mexicana show for the Laredo Lulacs, during the Washington Celebration in Laredo. More great clips of Rita dancing. Be sure to click the full screen thing. I love Rita! Hope you enjoyed it…..TAN TAN ! ! ! Tricia Cortez of Laredo, Texas, joined the Rio Grande International Study Center in May 2010, where she currently serves as executive director of Laredo’s only environmental nonprofit organization. She is responsible for carrying out its mission to protect and preserve our only source of drinking water – the Rio Grande – and local green spaces. She is deeply committed to sustainable land-use practices, habitat protection, responsible water management, and improved quality of life for South Texas border residents. A San Antonio native, Tricia graduated from Princeton University with a Bachelor’s degree in public policy from the Woodrow Wilson School of Public and International Affairs with a minor in Mandarin Chinese. She moved to Laredo in 2001 and worked seven years as a senior reporter at the Laredo Morning Times. She drank the water, and the rest is history! Tricia remains in awe of the Rio Grande-Rio Bravo, and how much life this river gives each day to millions of people in the U.S. and Mexico. Constant respect and protection of this mighty yet neglected and endangered river must remain a top priority for our community. She hopes that each of you will join RGISC in this ongoing effort. “Pecos Bill just shot down Mother Nature in broad daylight,” said Tricia Cortez, executive director of the Rio Grande International Study Center, a Laredo-based nonprofit that worked on a 10-year campaign to get the Laredo plastic bag ordinance passed. RGISC and the City of Laredo will unroll a public awareness campaign asking the public and local retailers to stay the course, and to keep making the right changes for Mother Earth. Cortez noted that this is a hollow victory for the Laredo downtown merchants since the leader of the group, Les Norton, doesn’t even live in Laredo. “It’s amazing that a tiny group of downtown merchants, headed by someone who doesn’t even live in Laredo, could halt progress and beautification efforts for the rest of the 250,000 people who live in this community,” she said. RGISC, an environmental nonprofit, helped lead a 10-year campaign to ensure passage of the Laredo ordinance through the Laredo City Council. When earlier attempts failed in 2008 due to lobbyists hired by the Laredo downtown merchants, Brownsville took inspiration from Laredo’s efforts and enacted their own ordinance, becoming the first city in Texas to do so. The cities of Austin, South Padre Island, Freer, and Fort Stockton among others soon followed in their footsteps. Raul Flores, Jr., was in my 9th grade English class at Christen Jr. High School in Laredo in 1957, when I was 21 years old, and he was 14. Below you can read one of his poems, about Zapata, Texas, where he lived as a kid. But he was born in Laredo, where he returned as a teen to live in order to go to school. He writes about being in my English class as an enjoyable task, and he is thankful I was his teacher. Enjoy his poem below, learn all about his education for his professional work, as well as his family endeavors. Raul was born in Laredo in 1943 and grew up in both Old Zapata and the new town. He went in elementary schools in Zapata, and moved with the family to Laredo in 1957. Attended one year at L.J. Christen Jr. High and graduated from Martin High School in 1961. Graduated from Texas AM University in 1966 with a degree in architecture. Joined the USAF and was discharged honorably in 1970. He worked with the City of Laredo and established the City’s first Building Department from 1975 to 1979. From 1979 to 1999 worked as V.P. of construction for Armadillo Homes. After returning to work for the city’s Planning Dept, he retired in 2004 and moved to Houston. He now spends lots of time with his four grandkids, attends many Houston Astros baseball games, reads a lot, and writes as much as time allows. During my 32 years on the faculty of Beverly Hills High School I directed/produced yearly a major school assembly on the topic of 5 de mayo. It was a major culture lesson through music, song, and dance of Mexico. The school assembly was called FIESTA BEVERLY. 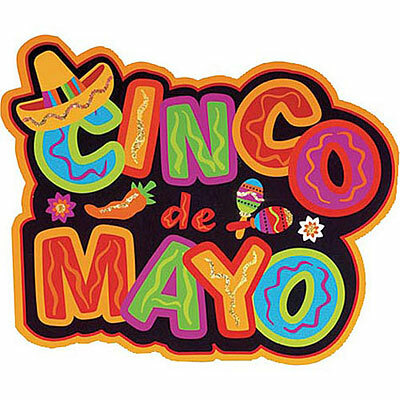 “El Cinco de Mayo,” or fifth of May, commemorates the triumphant victory of the Mexican forces over the French interventionists in 1862. The highly out numbered Mexican force s acquitted themselves in a valiant manner against the highly trained and equipped French Army led by Veteran General Charles Ferdinand Latrille de Lorencz. The over confident French Forces figured they would have an easy march from the port city of Veracruz to Mexico City. However, the Mexican forces commanded by General Ignacio Zaragosa and Brigadier General Diaz, outclassed and outman euvered the stunned stunned French Army which was humiliatingly defeated in the fortified city of Puebla. General Zaragosa, managed his troops with rare aplomp. The decisive manuever of the day was carried out by Brigadier General Diaz, who repelled a determined assault on Gen. Zaragosa’s right flank. The dejected French invaders, many vet erans of more glorio us days, retreated to the city of Orizaba. Hence, May 5 —“El Cinco de Mayo,”— was added to the National Calendar of Holidays in honor of this heroic Mexican Victory. About a year later, after receiving 30,000 reinforcements from France, the French forces led by General Elie Forey surrounded the city of Puebla and bombarded it into submission. However, the glorious “Cinco de Mayo,” Mexican victory, marked the beginning of the end for the French Intervention in Mexico. “El Cinco de Mayo,” is an official holiday in Mexico and is celebrated with a host of festivals, military parades, and formal and official gatherings of elite social and political leaders. 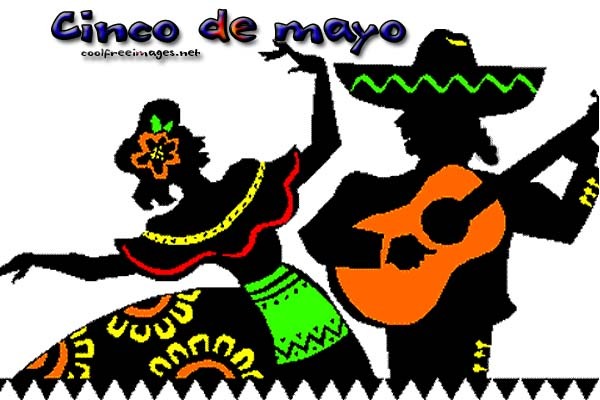 In America, the 5th of May, is celebrated by Mexican Americans in a similar fashion, but without all the conventional formality. Hispanics commemorate this day with outdoor folk concerts, picnics, dances, youth parades, and other relat ed festivals and activities. “El Cinco de Mayo,” offers Hispanics in the USA, the opportunity to touch base with their cultural heritage, and to take pride in one of Mexico’s great military. NEO NOTE: Again, a million thanks to writer Roberto Franco Vazquez and LARED LATINA for keeping us informed so beautifully. Now, let’s go out and celebrate ! HAPPY 100TH BIRTHDAY TO NELDA DRURY! On April 21 I will be 83, but that figure seems insignificant when I think that the same month this year is dear friend Nelda Drury’s 100th birthday ! ! ! When Nelda found out years ago that I was going to go to New York City during the summers to study dance and get my Master of Arts degree in Dance and Related Arts, she quickly got in touch with me. She had studied at Columbia, and she wanted to make arrangements with Mrs. E. F. Young of NYC for me to rent a room in her apartment. Nelda had rented from Mrs. Young when she attended Columbia. And so, I ended up living two blocks from Columbia U., and I would walk everyday by the world-famous Juilliard School of Music, which was on the way. To this day, I have to thank Nelda for such great help, when I really needed directional guidance. Btw, Nelda also got a Master of Arts degree in Dane and Related Arts from Columbia U. in NYC, like I did. Nelda Drury, who turns 100 in April, founded the San Antonio Folk Dance Festival, which is marking its 60th anniversary. Nelda Drury posted for this photo in the 50s, which is when she founded the San Antonio Folk Dance Festival. The event marks its 60th anniversary in March, about a month before Drury turns 100-years-old. Drury herself is celebrating a landmark this year. In April, she turns 100. Nelda Guerrero Drury is the daughter of Adelfa Gonzalez, sister of María and Aminita Gonzalez, the latter two prominent Laredo, Texas, school teachers. At the age of five, Nelda gave her first dance performance during a celebration in a small town in Texas. She grew up learning a wide variety of Mexican dances. 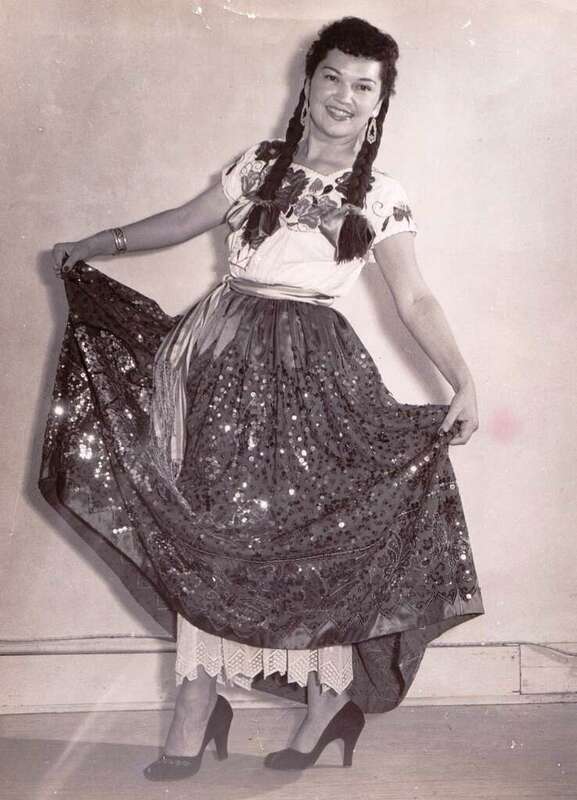 Serious study of dance began for Nelda at the University of Mexico in Mexico City under the late Alura Flores de Angeles. 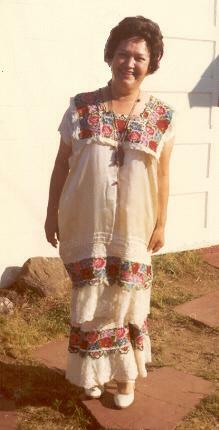 While teaching Mexican dance at the Texas Folk Dance Camp, Jane Farwell invited Nelda to teach at the Mt. Horeb camp in Wisconsin. Invitations to other camps on the east and west coasts followed in close succession. In 1956, Nelda traveled with Michael and Marianne Herman on a State Department sponsored trip to Japan, where she shared the Mexican culture with enthusiastic dancers. Nelda taught Mexican, modern, and ballroom dance full time as Professor of Dance at San Antonio College in San Antonio, Texas. She earned her bachelors degree from the University of Texas, then headed the girl’s Physical Education Department at Martin High School, then the only high school in Laredo, Texasa. She left to study at Columbia University in New York where she earned her masters degree. She did additional post graduate work at the University of Mexico. Nelda has done extensive research in Mexican, Central American, and South American dance. Her teaching has taken her throughout the United States, Mexico, the Orient, and Europe, presenting her seminars and displaying her dance form. She has a wealth of dance costumes that she has collected on her round-the-world travels. Nelda has been an instructor at Columbia University’s Summer Graduate Seminar of Dance; an instructor at the University of Texas Graduate Seminar of Dance; a guest instructor at the universities of Wisconsin and Mexico; the American University in Beirut, and the Texas Women’s College in Denton, Texas. She also has been a guest instructor at folk dance camps: Maine Folk Dance Camp, which she was instrumental in founding; Folklore Village Camp; Idlewild Dance Camp; Santa Barbara Folk Dance Camp; University of Pacific Dance Camp (now Stockton Folk Dance Camp); Los Alamos New Mexico Institute; the National Folk Festivals in Washington, D.C., New York, and St. Louis; Lighted Lantern Folk Dance Camp above Boulder, Colorado; The Folk Arts Center in Boston; and the New England Folk Festival, also in Boston. 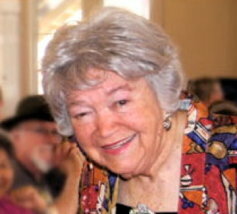 Nelda retired from her faculty position as head of the Danced Department at San Antonio College in Texas in 1986, but in 1995 she received the Ford Salute to Education, presented by Ford vice president Ross Roberts, which reads, “Nelda Guerrero-Drury is recognized nationally and locally as one of the most prominent figures in performing arts – specifically International Folk Dance. She is an inspiring individual who has contributed over 40 years of her life teaching folk dance to many students and educators in San Antonio and throughout the world. Her folk dance teaching skills and talents have been a “passport” to such countries as Japan, Switzerland and Germany. Nelda is a retired Professor Emeritus from San Antonio College where she founded the Annual Folk Dance Festival. She was conferred with the National Dance Association (NDA) with its highest award given for a distinguished record of accomplishment at the NDA’s annual meeting in Cincinnati, Ohio, on Saturday, March 31, 2001. This award was not only a great honor for the personal affection and regard of her colleagues in the dance world, but also the first time the award has gone to a teacher with a community college career. She received the “Heritage Award” from the National Health Physical Education and Dance Association, during which she was given a scrap book filled with congratulatory letters from other dance enthusiasts and teachers. In 2008, Nelda received an award for “special recognition for her 50 years of dedicated work” for the San Antonio Folk Dance Festival. In 1994, she received the National Folk Organization’s “Certificate of Merit” and in 2014 their “Preserving Our Heritage” award. Nelda is the Vice President of the International Folk Culture Center in San Antonio, Texas, where she directed the weekly International Dance Program and its outreach programs. She continues to organize folk dance workshops and seminars in Texas while her son Jimmy Drury and daughter Liz Drury continue the family teaching tradition. Nelda no longer teaches or travels. 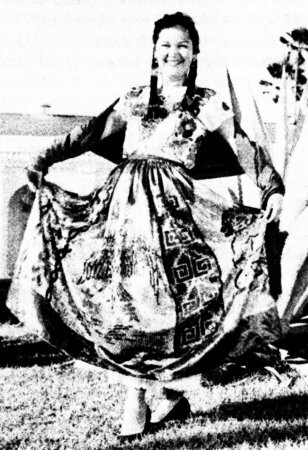 Dances Nelda has taught include Caballos Panzones, Carnavalito, Chiapanecas, Chilena Guerrerense, Colas, Country-Western Schottische, El Ausente, El Bolonchon, El Huateque, El Jarabe Tapatío, El Limpia Sillas (Ranchera), El Mezquitón, El Naranjo, El Rascapetate, Evangelina, Guadalquiver, Guerrerense, Isas, Jarabe de la Botella, Jarabe Tapatio, Jarabe Michoacano, Jesusita en Chihuahua, Jota Criolla, La Adelita, La Bamba, La Bruja, La Capsula, La Chilena, La Danza de los Machetes, La Danza de los Viejitos, La Varsouvianna, La Jota Tapatia, Las Iguiris, Los Jorongos, Los Viejitos, Lucero de la Mañana, Mexican Mixer, Mosaico Mexicano, Pezinho, Polka Alegre, Ranchera, Santa Rita, Sonajeros, Tango Poquito, Teatro Principal, Ten Step Polka, Tiempos Aquellos, and Tilingo Lingo. NEO NOTE: HAPPY 100TH BIRTHDAY, NELDA ! ! ! WE LOVE YOU ! ! !